Meditation, Avinol PM, Or Both? Sleep Better Starting Tonight! These days, meditation - especially the subgenre named "mindfulness meditation" - is being touted as the cure for everything from pain to anxiety to even sleep problems. But is it a truly effective technique for helping restless people get the sleep they need, or is it all hype? We decided to take a look at the question, and we came up with some very interesting answers. We hope our efforts will help you learn something new about yourself, and your nightly sleep habits. Within the last decade or so, there has been a lot of scientific research thrown behind proving (or disproving) the claims made by those who swear by meditation. Some studies have been inconclusive, whereas others have yielded some very surprising results. Based on what science and medical experts know so far, though, there is some strong evidence to suggest that meditation could help people suffering from insomnia or other sleep disorders. The University of Massachusetts recently conducted a study out of the Stress Reduction and Relaxation Program conducted by their medical center. Overall, the study discovered that people who meditate have higher levels of melatonin naturally circulating through their system. This was especially true for people who meditate on a regular basis. But it isn't all about cumulative effects. The study also showed that when regular meditators skipped a night, their melatonin levels were uncharacteristically lower than they would be on a meditation night. Melatonin is essential for healthy night's rest because it helps regulate your circadian rhythm, elevate your mood, and even acts as a protective antioxidant. However, exposure to bright light and anxious thoughts repress its release in the body. While the scientists behind the Massachusetts study don't claim to understand why meditation boosts melatonin production - although they know that it does - the explanation could be a very simple one. Closing your eyes blocked out all light, especially the harmful blue light from electronic devices that typically blocks melatonin release. Furthermore, concentrating your thought patterns on something other than anxious or ruminating ideas can help block stress hormones like cortisol which may prevent your pineal gland from releasing melatonin in the first place. More specifically, meditation helps improve the REM stage of your nightly sleep cycle. While every stage is important in its own way, decreasing or interrupting the amount of REM sleep you get can have detrimental effects on your brain and your body. It can reduce your ability to write permanent memories into your psyche, decrease your ability to learn, and make you feel groggy and fatigued in the morning. Part of it has to do with meditation's effect on the pons region of your brain. Not only does the pons regulate melatonin production and release, but it also plays a major part in how your brain processes the day's information while in REM sleep. Furthermore, the more complete and robust your REM sleep sessions are, the more neuroplasticity you have - which is a strong sign of good brain health. Experts aren't sure whether getting better REM sleep leads to more neuroplasticity or weather having high neuroplasticity produces quality REM sleep; but they know that the two are deeply interconnected, and there are some strong signs that meditation can enhance at the very least REM sleep, if not both. When people have trouble sleeping at night, it can sometimes be attributed to their brain wave state. Feelings of anxiousness and stress are most common when your brain is in a beta wave state. Since most people don't know how to help their brain shift from one wave state to another, getting your brain out of a beta wave state so that you can fall asleep can feel like an impossible task. However, meditation experts insist that it can get the job done. When performed correctly, meditation can transition your brain into an alpha or a theta wave state. Both of these stages are excellent for the shallower stages of your sleep cycle. With enough practice and expertise, you may even be able to shift into a delta brainwave state, which is the deepest brainwave state the mind can occupy. It is usually reserved for the deepest parts of your sleep cycle. Have you ever laid awake at night, tossing and turning, because you couldn't stop your brain from racing at a million miles an hour? Or maybe there was one specific thought in your head that got stuck in your craw, and you couldn't get it out? It can be a serious problem, especially if you don't have any tools in your toolbox to help you distract yourself. But meditation may be able to help you fix that. By focusing and concentrating on other things, such as your breath, it may be able to take your mind off of stressful thoughts just long enough to relax and fall asleep. More tips for relaxing naturally. Are There Any Arguments Against Meditation for Sleep? There is a rare phenomenon that science is starting to shine a light on known as Relaxation Induced Anxiety (RIA). This affliction, as far as science knows, affects up to 15% of the population. Not to be confused with people who just get bored or feel no benefit for meditation whatsoever, RIA is a specific stress reaction to any attempts at relaxing oneself. This condition can be, within the context of medication, triggered by feelings of discomfort from slow thoughts or a loss of control upon actual relaxation achievement. Because the condition is so rare and poorly understood, doctors don't necessarily agree on a specific treatment. Some suggest, however, that facing your fear by confronting your triggers head on can help reduce your symptoms. 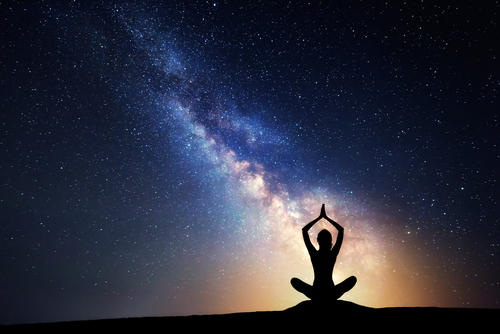 Whether you're a seasoned meditator, a young grasshopper in the meditation world, or whether you're just curious about it, you don't have to rely on meditation alone in order to relax at night. Furthermore, if you're entirely turned off by the idea of meditating at night, you have other options. Avinol PM is a natural mix of botanical extracts and sleep hormones like melatonin. It's designed to help you feel relaxed and sleepy. It's affordable, easy to take, and it has helped thousands of people overcome their sleep challenges. Why not give it a try yourself?